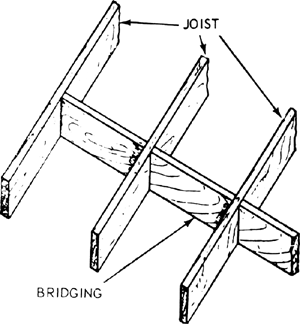 A wooden member fastened between or across floor joists to stiffen them or to carry a partition. A programmatically similar but expressively contemporary structure has been erected behind, parallel to the ersatz manor, and the two wings are connected by a bridging piece for reception, conference rooms and cafe. Complicating matters, 20 billets, 10 administrative buildings, and several burned-out Iraqi mobile bridging pieces stood where the planned logistical base was to go.